Illuminate your home in spooky Halloween hues this October and experience the fun found in these vivid lights! Our commercial quality LED icicle lights are virtually unbreakable, weather resistant and maintain professional display even after years of rough handling. 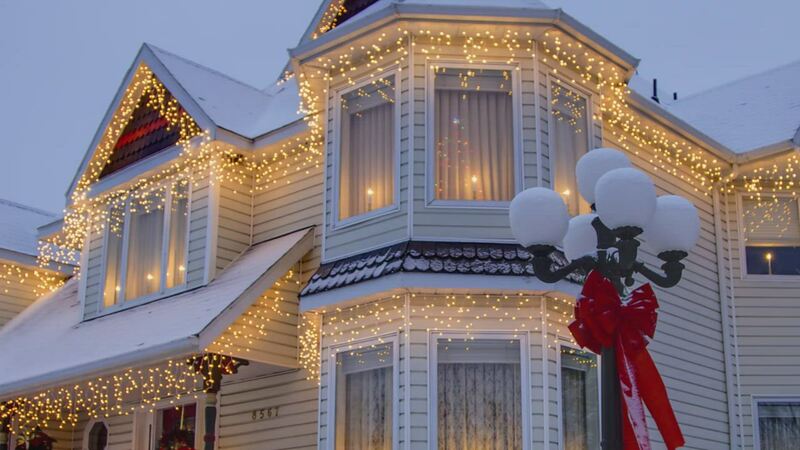 Hang amber and purple LED icicle lights from the roof or along the porch. The black wire blends well against darker surfaces and fabrics making these fun light strands perfect for concealing behind haunting Halloween decor! A little pricey, but they look great! It would be better if the strings were twice as long. Good quality. These lights are really bright for a dark color like purple. I ordered 14 sets and they all worked. They do not come with extra bulbs. Reviewed by G V N.
Sets the mood for Halloween! Brilliant colors! I like that you can string many strands together. Lights are very bright and do not get tangled in the wind. They hang straight down. When stretched out, the icicles barely meet the measurements listed online. The bulbs are an ugly, cylindrical and made of plastic. For the amount of money I spent, I had expected more. At first, I was skeptical about the purple and orange combination, but they really look good together! I love that the icicles are long. Half of the lights on one string went out after only a day of use. Love the deep, bright colors. Very nice, but would like to have a longer strand. Lead Length: 6 in Drop Length: 7" - 4" - 6" - 3"